Is the Stay 3, Pay 2 American Express Promotion at Radisson a Good Deal? You get 1 night free at participating Radisson hotels (except Radisson Blu hotels) when you pay for 2 consecutive nights with your American Express card by January 15, 2015. But do you save money? Or will you pay more for your hotel? Let’s find out. When you pay with your American Express card, you can stay 3 consecutive nights, but pay for 2 at participating Radisson hotels (excluding Radisson Blu hotels) through January 15, 2015. Only Radisson hotels in North American and South America are part of the promotion. 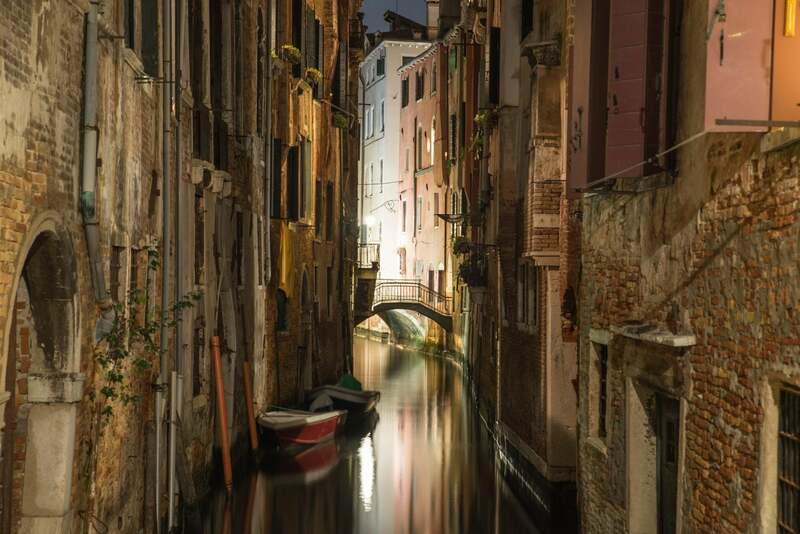 You can use any American Express credit or charge card to pay for your room. But you have to book 3 consecutive nights. So you can NOT book 1 night on Friday, a 2nd night on Sunday, and the 3rd night on Monday. Book your room online or by calling Radisson at 800-333-3333 and ask for the “Stay 3, Pay 2” offer. Sometimes when you use special promotions or codes to take advantage of promotions, you pay more. So I checked a couple of places to see if it’s worthwhile. Will You Save Money in Minnesota? With the AMEX – Stay 3, Pay 2 promotion, you’d pay ~$393 to stay at the Radisson Hotel Bloomington by Mall of America to relax after your Christmas shopping from December 26, 2014, to December 29, 2014. Without the promotion, you’d pay ~$582 on the Radisson website and through Kayak! On the other hand, folks with the Club Carlson card can get 1 award night free on stays of 2 nights or more. Normally the Radisson Hotel Bloomington by Mall of America costs 38,000 Club Carlson points a night. So Club Carlson cardholders could book 3 nights for 76,000 Club Carlson points (38,000 Club Carlson points a night X 2). 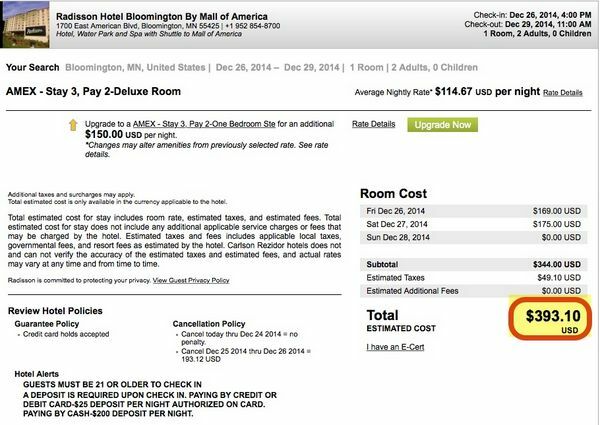 But the Radisson Hotel Bloomington by Mall of America is NOT available on Club Carlson points for December 26, 2014, to December 29, 2014. So in this case, you’re better off with the AMEX promotion because you can NOT use points for your dates. Sometimes rooms aren’t available using points so you should always check for promotions when you have to pay cash. Will You Pay Less in Plymouth? 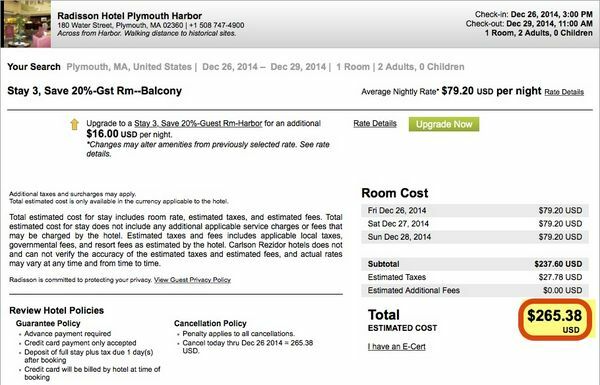 You’d pay ~$221 to stay at the Radisson Hotel Plymouth Harbor from December 26, 2014, to December 29, 2014. But you’ll pay ~$265 on the Radisson website and Kayak if you do NOT use the promotion. How about using points instead of cash? You’ll pay 38,000 Club Carlson points a night at the Radisson Plymouth Harbor. So with the Club Carlson card, you could book 3 nights for 76,000 Club Carlson points (38,000 Club Carlson points a night X 2 because you get 1 night free). But you’re only paying ~$221 for 3 nights which means redeeming points will only be worth ~0.3 cents per point a night (~$221 cost of room with promotion / 76,000 Club Carlson points). I’d rather save my Club Carlson points to use for 2 night stays when hotel rooms are more expensive like at the Radisson Blu Marina Hotel Connaught Place in India. 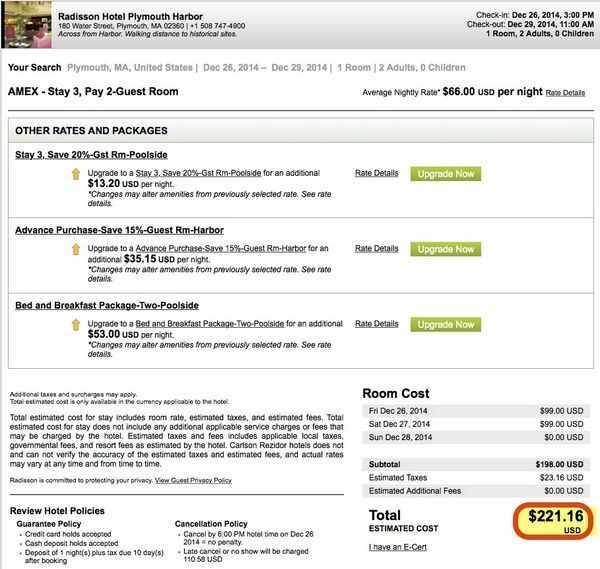 Two nights at ~$102 per night would be cost ~$204 in cash. Instead Club Carlson cardholders could use 38,000 points because they’ll get the last night free. 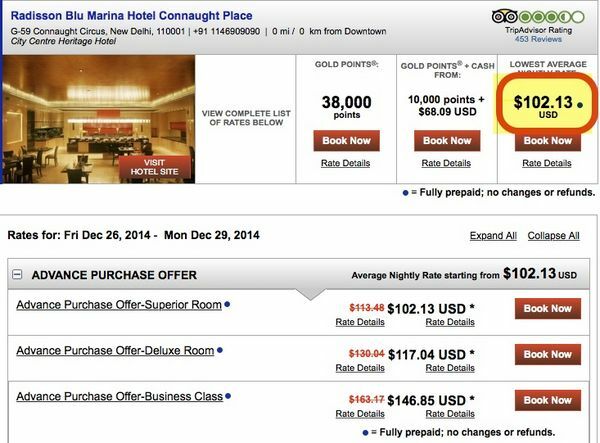 So they’ll get a value of ~0.5 cents per point (~$204/38,000 Club Carlson points for the 2 nights). The best value with the Club Carlson card is when you book just 2 nights at an expensive hotel because you’ll get 1 night free! So Should You “Stay 3, Pay 2” or Stay Home Instead? For folks who plan on visiting Radisson hotels through January 15, 2015, the Stay 3, Pay 2 American Express promotion at Radisson looks to be a good deal. 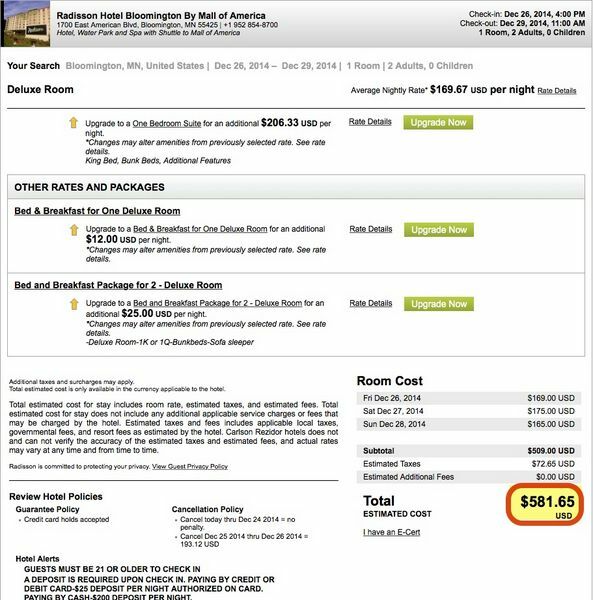 But you might want to compare prices for your particular Radisson hotel to be certain. You can stay 3 nights for the price of 2 at participating Radisson hotels (excluding Radisson Blu hotels) through January 15, 2015, when you pay with your American Express card. However, only some Radisson hotels in North America and South America are taking part in this deal. And you have to book 3 consecutive nights to get the 3rd night free. You can book your room online or by calling Radisson at 800-333-3333 and ask for the “Stay 3, Pay 2″ offer.